Produced by the double IFTA Award-winning team at Gifted Empire Productions, FleadhTV is going from strength to strength this summer. The shows from the four provinces of Ireland, the Connacht, Leinster, Munster & Ulster Fleadh's have been topping the TG4 ratings in the month of July 2018. Now it's time to get to the All-Ireland. A programme coming from the monstrous event that is Fleadh Cheoil na hÉireann has now become one of TG4's flagship programmes of the year. 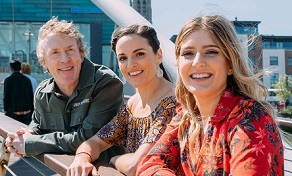 FleadhTV first appeared on TV screens in 2013 with Fleadh Cheoil taking place in the North of Ireland, for the first time, in Derry (then titled Fleadh Live), in 2017 the series was watched by over 700,000 over the weekend of live shows. However FleadhTV isn't just a music TV show, it's one of the leading lights of multiscreen viewing with their social channels exploding with content. On Fleadh week last year, 1 million video views were logged on its social networks. In July 2018 alone their social channels had video views of over 500,000, the appetite is there, this is a very social Fleadh! For the FleadhTV shows in August there is an extra show so it's now running from Thursday 16th August to Sunday 19th August inclusive from 8.30pm to 11.30pm each night. Fleadh Cheoil 2018 will be taking place on the East Coast of Ireland in Drogheda. Acts confirmed to appear on the shows include Zoe Conway, Finnegan McSherry, Duke Special & Ulaid, Rioghnach Connolly, Declan O'Rourke, Karen Casey, Mícheál Ó Súilleabháin, Kíla, The Evertides and Frankie Gavin's Roaring 20s Irish Orchestra. Hector Ó hEochagáin returns this year and joining him in her debut on FleadhTV is renowned musician and Gaeilgeoir Doireann Ni Ghlacáin. New to the presenting team also is well known RTÉ Radio 1 presenter and lead vocalist from The Evertides Ruth Smith. Gifted Empire Productions produce FleadhTV for TG4. Gifted Empire Productions are a Derry based TV Production company that has won two IFTA Awards for their shows. In 2015 they took home the IFTA for Best Life Event for FleadhTV and in 2018 they won again in Best Live Event for TG4XX Beo, the 20th anniversary celebrations of TG4 from NUIG. Paul McKay is Executive Producer and Director. Gifted Empire Productions will produce a brand new TV show from Derry on October 31st, 2018. Samhain Live will celebrate the city's spectacular Halloween celebrations for the first time on live TV. Samhain Live will be jointly broadcast by BBC Northern Ireland and TG4. The show will feature some of the very best of Irish contemporary musicians and bands.